Outdoor cooking has never been more fun and flavorful with the versatility and ease of wood-fired grills. Nothing provides more reliability and heat output per dollar than a free-standing wood or gas stove. 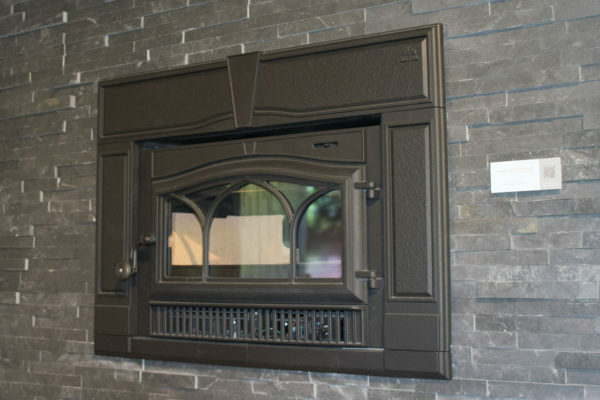 Wood, gas, or electric fireplace inserts are the easiest and most cost effective way to turn your inefficient wood fireplace into a eye-catching high-performance heater. When a focal point is the goal, nothing compares. A fireplace will provide an area for family to gather to enjoy the beauty of wood, stone & fire. No two houses are the same, this is why we carefully consult every customer both in our showroom and at the home. Our goal is to provide you with a functional, practical and beautiful end result that meets your budget and exceeds your expectations. Lakeside Fire & Grill is expanding into natural and manufactured stone veneer to round out your project. A genuine staff with an honest goal of exceeding your expectations. Whether you cook with charcoal, wood, pellets, or gas, Lakeside Fire & Grill carries your favorite brands including Big Green Egg, Yoder Smokers, Traeger, Weber, Memphis Wood-Fired Grills, and Green Mountain Grills. Fair pricing and genuine treatment before, during and after the sale makes Lakeside Fire & Grill a wise choice for your burning desires.